Say goodbye to the old and worn out minivan look and hello to an all-new style when you drive the Chrysler Pacifica. What started as a clean sheet of paper and a desire to create a one of a kind minivan, has resulted in a minivan built from advanced architecture. The Chrysler Pacifica has striking good looks and unheard of functionality. This minivan for sale offers more features than many of its competitors and is the highest ranked minivans in initial quality in 2017 by J.D. Power. The Chrysler Pacifica for sale comes with best in class safety, storage, and technology feature that you will not want to miss. 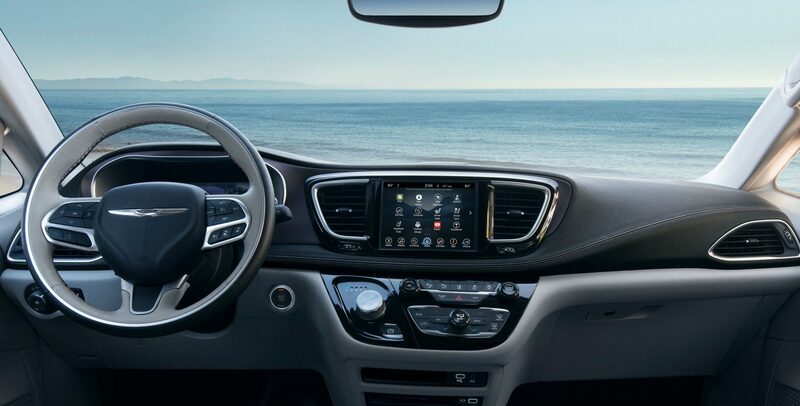 The place to find a large selection of the new Chrysler Pacifica for sale is at Ewald Chrysler Jeep Dodge Ram in Oconomowoc, Wisconsin. Unlike its competitors, the Chrysler Pacifica has stepped outside of the standard minivan box and into a new light. With eye-catching features including a sleek profile that looks more like an elongated crossover than a minivan. 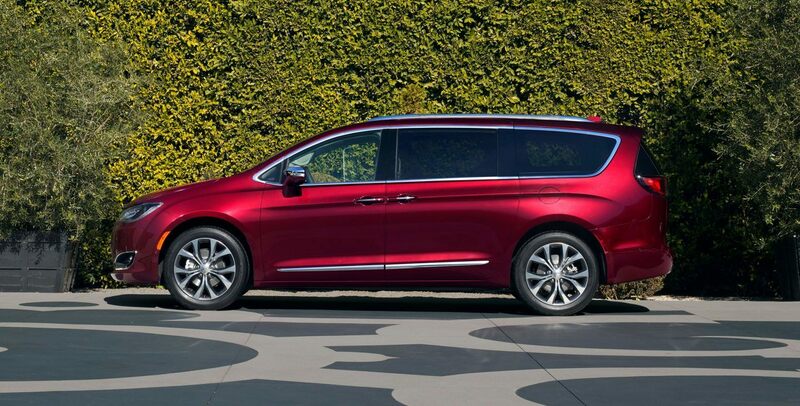 The Chrysler Pacifica sliding doors and tracks are hidden as much as possible. The tracks are hidden from sight so your minivan will have a seamless profile. Giving the Pacifica an elongated look that adds to the overall sporty style. LED daytime running headlamp is finished in chrome for a cohesive appearance, while the chrome elements of the grille blend seamlessly into the projector headlamps. With alloy wheels and a one of a kind style, this Chrysler for sale is sure to turn heads. 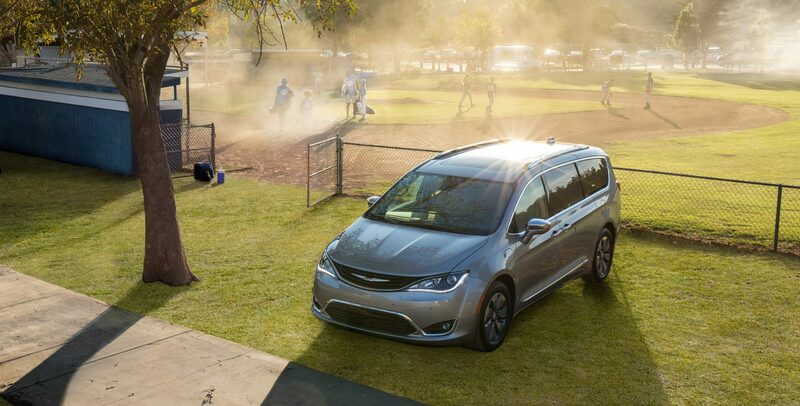 When you need a minivan but want style, you will not want to miss the Chrysler Pacifica. 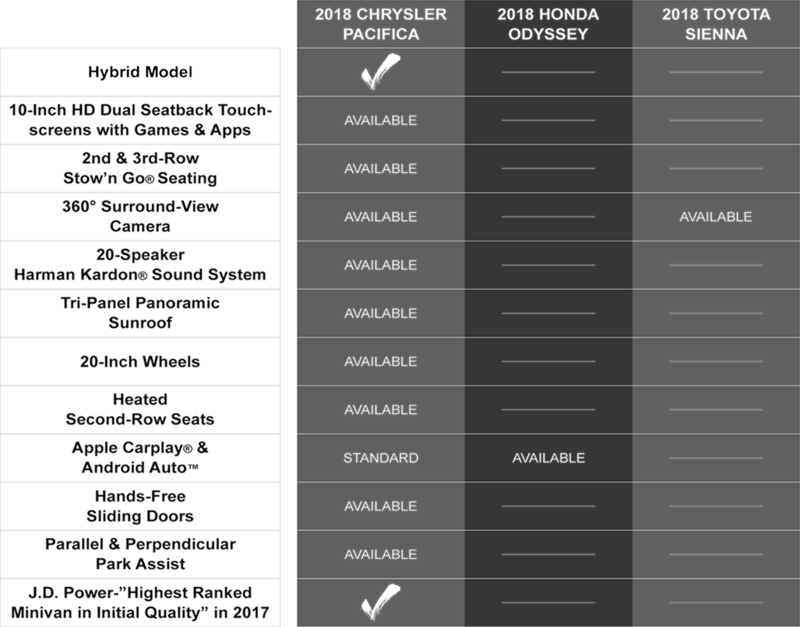 Compared to its competitors the Chrysler Pacifica comes with the best in class features. Including a premium entertainment system, and touchscreen command center. Bluetooth connectivity and connect apps accessing all of your favorite phone apps has never been easier. An available 360° exterior camera provides a bird‘s-eye view of the Chrysler Pacifica. Now you can see from every angle without ever leaving your driver's seat. Your eyes are not the only things watching the road in this Chrysler minivan for sale here in Oconomowoc, WI. With best in class safety features including blind spot monitoring, forward collision alert, and emergency braking assist. The Chrysler Pacifica is the only minivan to be named a 2017 IIHS Top Safety Pick and will keep you and your family safe for many years to come. The Pacifica is both the tallest and widest van in its class providing more room for your passengers and cargo space when you need it. Advanced stow n go seating allows you to fold your seats all the way down for a perfectly flat surface. 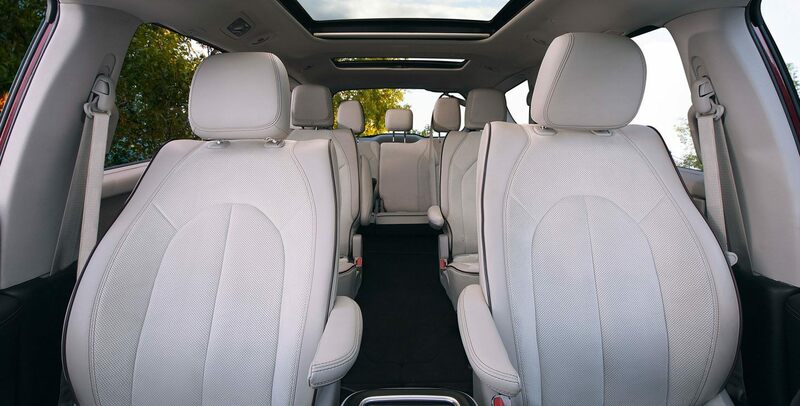 Even when all seats are empty, the Chrysler Pacifica remains fully loaded. Each feature was purposefully designed with the family in mind. Leather and cloth seats are both stain resistant and repel odors, so you never have to worry about sticky messes or juice stains ruining your seats. The dash is sculpted in a way that bears no resemblance the upright look from other vans, with their rectangular shapes. Make your road trips more comfortable with the Chrysler Pacifica here in Oconomowoc, WI.